Tomorrow I will be posting a calculation of French tax burdens by decile. The purpose of today's post is to consider three issues in additional detail. (1) How regressive is the French system? I found the French system to be pretty flat -- deciles 2-8 all paying in the low 50s percent of their incomes -- with the exception of deciles 9 and 10. For example, the average tax rate for the 10th decile was about fifteen percentage points less than the rates for deciles 2-8. As a matter of arithmetic, most of the dip at deciles 9 and 10 comes from the fact that France gets so much revenue from the payroll tax, and my assumption that the decile-pattern of payroll tax collections is the same in France as the CBO estimated for the U.S., with, for example, the 10th decile paying at half the rate that deciles 1-8 do. (For these purposes, I consider France's "Contribution Sociale Generalise" as a separate tax with the same rate for all deciles). As a qualitative matter, I suspect that my French result is correct because much of the payroll tax in France was capped at less than 3000 Euros per month, and thus below the average (Piketty and Saez reported a French average household income of 38,665 euros per year). Moreover, the payroll tax does not tax capital income, and the high deciles are the more capital income intensive. Piketty and Saez (2007) looked at France's 10th decile's payroll tax rate. Their study was not designed to consider the lower deciles, and therefore not designed to calculate an all-decile average, but they reported a 10th decile rate that was 87 percent of the average (here I have subtracted off the "Contribution Sociale Generalise," which they considered as part of the payroll tax), as compared to 63 percent the CBO found for the U.S. payroll tax. You might think that 87 and 63 are different because the countries are different, but interestingly Piketty and Saez found the U.S. 10th decile payroll rate to be 100 percent of the average rate, which means (a) they disagreed with CBO about the U.S. and (b) by this metric they find the U.S. payroll tax to be less regressive than France's. (2) Do Low Income French Really Pay that Much More? In case you are dubious that below-average-income French pay more tax than below-average-income Americans, consider a Frence household that earns 24,000 Euro per year (inclusive of payroll taxes paid by employers on this household's members' behalf -- the same income concept used by Piketty and Saez), entirely labor income at a rate of 14 Euro per hour, and spends 20% of that on food (4,800) and spends everything else (after taxes) on consumption items. (this calculation is entirely separate of the data I used to calculate tax rates by income decile). That French household has an annual income after employer contributions of 17,805 Euros, because French employers pay almost 35 percent payroll tax (8.3 percent to the old age program, 1.6 percent to the survivor's program, 13.23 percent to the health insurance program, 2.26 percent to the work injury program, 4 percent to the UI program, and 5.4 percent to the family allowances program; my source is here) on employees earning below the cap. Then the employee has another 9.9 percent taken out of his check for his "contributions," for a total of 7,957 Euros in payroll tax -- a third(!) of what this employee would earn if he were exempt from payroll tax. To be conservative, I will assume this already includes the roughly 5 percent flat rate "Contribution Sociale Generalise," and this household owes ZERO individual income tax. That leaves the household with 16,043 Euros, on which it will pay another 250 Euro on food VAT (the rate is 5.5 percent) and 1,842 on other VAT (the rate is 19.6%). So from payroll and VAT alone that is a tax bill of 10,050 Euro, or 42 percent of its income. Compare to an American who would pay 16 percent in payroll taxes and probably less than 4 percent on retail sales taxes for a combined payroll and sales tax liability of less than 20 percent of its income. This is yet another way to see that tax burdens on below-average-income French must be double, and probably more, the tax burdens on below-average-income Americans. Last week I explained how the estate tax might be interpreted as a tax on capital income, and therefore ultimately born by labor. That's a reasonable approximation, especially in a closed economy analysis in which most of the capital employed in a country was owned by residents of that country. At the other extreme, one could think of wealthy French and wealthy Americans as owning essentially the same capital portfolios, so that the estate tax in one country would actually hurt workers all over the world, and not particularly workers in the country levying the tax. In the open economy case, one might assign estate tax incidence according to the decile of the payer, at least for the purpose of cross-country comparisons. This adjustment would have no perceptible affect on my results for the country tax rate gaps at deciles 1-9, but it would widen the France-U.S. gap at decile 10 by 1.5-2 percentage points. As one can see in the chart I posted today, it would still remain the case that the France-U.S. gap at the 10th decile is a small fraction of what it is at deciles 1-8. Home Prices during and after the "Homebuyer Tax Credit"
The Case-Shiller Composite 20 index averaged 144 during the months that the "Home Buyer Tax Credit" was in effect. This credit was claimed by many (including Professor Shiller himself) to be essential to housing market performance. As of September 2010 -- the most recent data available, and certainly after the credit was expired -- the index stood at 147. So now the evidence is supporting what economic theory said all along: if the Home Buyer Tax Credit were to cause housing prices to be higher, that effect would be at most minuscule. VAT: Another Reason for a Housing Boom? The U.S. does not have a national sales tax, or a value-added tax (VAT). Many other countries do have VAT, and a number of economists and accountants (not me!) have recommended that the U.S. get a VAT. Suppose that we knew that, say, a 10% VAT was coming to the U.S. in the year 2015. In principle, a consumption tax is levied on all forms of consumption, including housing consumption. However, in practice a VAT only taxes new housing -- that is, a sales tax is collected when a new home is sold, and no sales tax is collected on home resales or home rents (actual or imputed). Thus, homes built before 2015 would be 10% more valuable that home built after 2015, because only the latter would pay tax. So anticipation of VAT would cause a temporary boom in housing construction and new housing prices. Was something like this important during the housing boom of the 2000s? Who Pays the Other Taxes? The federal individual income tax may be progressive – it collects at much higher rates from higher income groups – but the collection patterns of other taxes are quite different. The federal government’s single biggest tax, the individual income tax is a complicated function of each family’s income from wages, investments and other sources. It is the subject of much analysis of its fairness. For example, the Congressional Budget Office found that, in 2005, the highest 10 percent of households in terms of income paid 16 percent of their income in federal income tax. The next 10 percent of households in terms of income paid 12 percent of their income. At the same time, the bottom 40 percent of households in terms of income owed, on average, no tax, in the sense that those households received more in refundable income tax credits than they paid in tax. That is the concept of progressive taxes — high-income households not only pay more tax but pay a greater fraction of their income in tax. It would seem, then, that taxes are something paid by people with above average incomes, without cutting noticeably into the purchasing power of people with lesser income. Although the personal income tax is the federal government’s single biggest tax, most federal revenue, and most state and local government revenue, comes from a combination of other taxes. Of these, the three largest are payroll taxes, sales taxes and property taxes, bringing a combined 12 percent of gross domestic product to public treasuries, as compared with 8 percent of G.D.P. collected by the federal income tax. (In order to abstract from the effects of the recession, and for reasons of data available, this post and next week’s focus on taxes as collected in the mid-2000s. How things may have changed since then can be seen here and here). Sales taxes collected from retailers are an important revenue source at the state and local level, and are not significantly progressive even when they tax “necessity” and “luxury” items at special rates. Payroll taxes are regressive, because the tax rate on the first $100,000 or so of earnings (this level has varied by year) is five times the tax rate on earnings above $100,000. When interpreted as a tax on housing, the property tax is also somewhat regressive, because high-income people spend a lesser fraction of their income on housing, especially on the rental housing that is often subject to higher property tax rates than owner-occupied housing. Corporate, estate and other taxes on capital may appear to hit wealthy taxpayers disproportionately, but I explained last week how that appearance is deceiving and inconsistent with the economics of capital taxation, which says that workers bear much of the burden of capital taxes in the former of lower employment and wages. For this reason, I assume that capital taxes have essentially the same income incidence as sales taxes, although quantitatively results for the total tax burden would be pretty similar if I assumed (contrary to economic reasoning) that capital taxes are borne by who writes the checks to the government, because capital taxes don’t bring in much revenue. 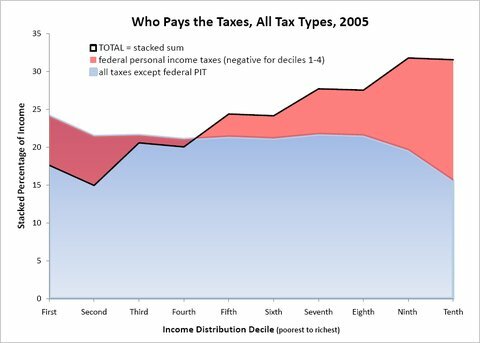 The chart below shows the progressivity of taxes in 2005 by comparing income shares paid in taxes across income deciles. The bottom area shows the combined income shares of all federal, state and local taxes with the exception of the federal individual income tax. The shares paid in federal individual income tax are stacked on top of the bottom area, so that the sum of the two shows the shares of income paid in all taxes. For example, the top decile (the 10 percent of households with the highest incomes) paid 15.5 percent of their income in the other taxes, 16 percent of their income in federal income tax and 31.5 percent of their income in all taxes combined. The bottom decile paid 25.8 percent of their income in other taxes and -6.5 percent in federal individual income tax (that is, the tax paid them in the form of a refundable credit), for a combined total of 19.3 percent. To derive these results, I used calculations from the Congressional Budget Office for the federal taxes, with the exception of the capital income taxes cited above. For the state and local taxes, I used the calculations of the late Joseph Pechman, published in 1985. Because of a lack of data, I excluded a significant amount of “miscellaneous receipts” by state and local governments (e.g., revenues from the state lottery), although I suspect they are regressive, too. In the years since Professor Pechman made his calculations, the average state and local taxes have not experienced the kinds of changes that federal taxes did with the 1986 tax reform and with President George W. Bush’s tax cut, so I simply rescaled his calculations to reflect the minor changes in the share of G.D.P. obtained by state and local taxes. Beginning with the blue series in the chart, we see that other taxes are regressive. The poorest decile pays the largest fraction of income in those taxes – more than 25 percent – while the highest income decile pays the smallest fraction of its income – less than 16 percent. (By definition, the high-income deciles have more income, so they pay more absolute dollars in tax even while their fractions are lower). Especially noticeable is the dip from the 8th to the 10th decile, which occurs because much of the payroll tax is capped and does not apply to capital income, which is relatively more numerous in the higher deciles. (Note that the 9th and 10th decile are not the “quarter millionaires” that have received so much attention in recent tax debates; they would be only a minor fraction of the 10th decile. For a paper that looks at federal taxes for the top couple of percentiles, click here). Total tax payments are the combination of other federal individual income taxes and the other taxes, and are mildly progressive. The fraction of income paid in all taxes (shown as the black line in the chart) tends to rise with income; it is about 20 percent for the lowest four deciles, about 25 percent for the middle two deciles and about 30 percent for the highest four deciles. As noted above, the bottom deciles pay negative individual income tax, so for them the combined tax rate is actually less than the “other” tax rate. Although low-income Americans pay little, if any, individual income tax, much of their income does go toward payroll, sales, property and other taxes. When all taxes are considered, most income groups pay taxes that amount to roughly 20 percent of their income. Added: To calculate sales tax incidence for 2005, I scaled Pechman's 1985 estimates to reflect changes in the amount of revenue obtained by those taxes. However, the technology for sales tax avoidance has changed a lot over those years -- in particular, many people avoid sales tax by making purchases on the internet. To the extent that the internet intensity of a household's purchase patterns rises with its income, sales taxes in 2005 are even more regressive than I have assumed. Even if you do not receive a bill from the tax collector, your living standards are still affected by taxes. To understand who wins and loses from capital taxation, consider your personal experiences with theft. Many people, including me, lock the doors of our homes and automobiles. We do not make a habit of keeping valuables in the car or large amounts of cash in the house. We lock our computer with a password (or, at least, know we should) and are careful about giving out our personal identification numbers. Many apartment buildings have a doorman to monitor who enters. And law-enforcement departments keep an eye out for theft, along with their other duties. With all these precautions and defensive measures, perhaps your home, car and computer have never been burgled, nor your identity stolen. But that does mean that you are unharmed by theft. First, theft has a kind of “excess burden,” because of the actions people take to avoid it. Theft’s total cost is not only the value of any items stolen from us, but also the costs and efforts of protecting ourselves from additional thefts. Simply put, the value of what thieves obtain is less that the costs to theft victims. Second, theft victims are not the only ones whose living standards are reduced by theft, because third parties are affected as the theft victims react. For example, a store owner who has been robbed or burgled may shut his store or raise prices to pay for security and compensate himself for the risks of his business. Because of the store owner’s reaction to theft, his customers bear much of the cost of what is stolen from the store, even though they were never owners of the items stolen. Taxation is not necessarily the moral equivalent of stealing, but the same principles apply because of the chilling effect that each causes. Both taxpayers and theft victims have in common that they take actions to reduce what they pay. Prof. Richard H. Thaler, a colleague of mine at the University of Chicago, pointed out earlier this month that under President Obama’s proposal for the estate tax, 99.7 percent of people would not owe estate tax when they died, suggesting that the estate tax is something that affects only rich heirs and heiresses like Paris Hilton. His conclusion ignores two basic results from the economics of taxation: Some of the people do not owe estate tax because they spent resources avoiding the tax, and these avoidance behaviors affect third parties — as these taxpayers take steps to reduce their wealth, they may invest less or generate less economic activity. Because the estate tax is a tax on wealth, estate holders may accumulate less wealth than they would in the absence of the tax. In this regard, the estate tax has a lot in common with other capital taxes, like the corporate income tax and the personal income tax on “unearned” income. In principle, capital accumulation, or a lack of it, has effects that are not limited to the owners of capital. If some among them accumulate less wealth because capital taxation reduces their incentive to do so, they will have less to invest in existing enterprises or new companies. And that will not only benefit competitors, but also adversely affect would-be workers, vendors or other beneficiaries. The effect of capital accumulation on the rate of return enjoyed by capital owners is more than a textbook possibility — it is readily seen in the economic data. The chart below, adapted from one of my papers on capital accumulation, displays the annual national income accruing to the owners of capital, subtracting capital income taxes paid, and expressed as percentage of dollars invested. For example, a value of 5 percent means that $100,000 invested gave the owners of that capital $5,000 of income in a year, after taxes, in the form of interest, dividends, property rent or retained earnings in a business. What is striking about the data is how little they changed over the years. Capital income rates were almost always between 4.5 and 6.0 percent. 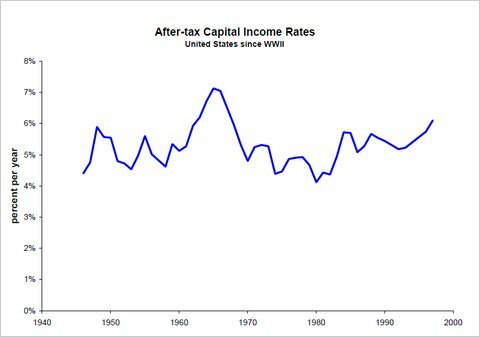 Although the population more than doubled, our economy grew by a factor of five or six, and tax laws changed many times, the owners of capital at the end of the 20th century were earning at rates much like the owners 50 years earlier. On average, the owners of capital saw little change in the rate they earned income as the economy dramatically changed its size, largely because of changes in the amount of capital and the competition among owners. The same logic does not seem to apply to labor — the amount that workers earn per hour, week or year depends very much on the size of the economy — because the supply of people for work adjusts less than the supply of capital does. For this reason, we expected taxes on capital largely to affect the amount of capital, have little effect on the rate at which capital owners earn income and ultimately to have a significant effect on employment and wages. You may think that the wealth accumulation of decisions of the mere 0.3 percent of taxpayers who pay estate taxes would have a minor effect on the rest of us, and you would be correct. But the estate tax also brings in little revenue — about $20 billion last year — so the minor effect on the rest of us is actually quite large in comparison to the revenue collected through the tax. Taxpayer losses from taxes are not limited to the amount received by the public treasury, and the losers from taxes are not limited to those writing the checks. MJ Perry has a remarkable figure showing how labor productivity changed during the recession. It's a nice example because output is measured in physical units -- barrels. Before the recession, each employee produced about 800 barrels. After the recession, each produced about 1100 barrels. 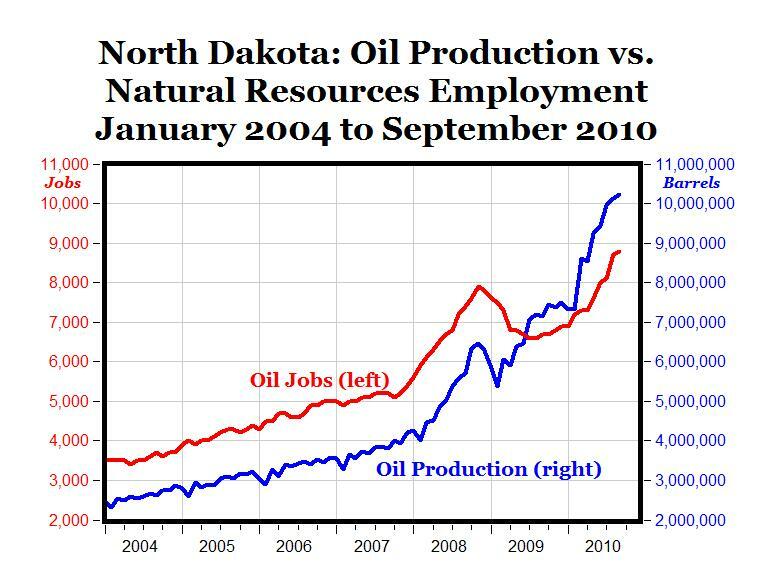 Added: A problem with this example is that it is difficult to separate employees who help produce oil from those who invest in future oil production, which may be reacting to time pattern of oil prices rather than the forces that caused the recession (HT: James Donald). The Obama administration’s proposal for the estate tax has all of the ingredients of a damaging tax – large exemptions and loopholes, confiscatory marginal tax rates and little revenue potential. The best reason for having such a tax, if there is one, is to tap into any punish-the-rich sentiment that may be in the electorate. The Obama administration has proposed an estate tax for 2011 and later years that is much like the one that was in place before to 2010. Writing in favor of the proposal, Prof. Richard Thaler of the University of Chicago acknowledged that the marginal estate tax rate “sounds high, almost confiscatory.” He then notes the $7 million exemption available last year, says that with it in place only 3 estates in 1,000 would have to pay an estate tax and adds that those with big-enough estates could afford a good lawyer to help them further increase the effective size of their exemption. But the huge potential for avoidance behavior is exactly why the proposal is so damaging from an economic point of view. Telephone-service taxes offer an example of a basic principle that applies to taxes on estates and just about everything else: the higher the rate of taxation, the more households and businesses that take steps to reduce their tax liability. Consider a business with, say, 1,000 telephone calls a day and no telephone tax. If the government began to assess a penny tax on each call the business pays for — outgoing, incoming 800 and collect calls — and the business did nothing in response, the business would owe $10 a day in telephone tax. But the business would probably consider alternative means of communicating with customers and suppliers and might soon no longer have 1,000 calls a day. It might, for example, switch some or all of its calling to an Internet-based system. Or it might give customers additional incentives to place orders or make inquiries on its Web site, rather than call using its toll-free number. These actions might reduce taxed calling to, say, 800 a day, from 1,000, and thereby reduce the telephone tax bill by $2 a day (see the middle column of the table below). But those actions would be costly to other parts of the business; some customers might be lost because they were not called, or revenue might be reduced through the incentives given to get customers to use the Web. Those additional costs would be roughly $1 a day. Ultimately this telephone tax brings $8 a day to the public treasury, but it costs the company $9: $8 sent to the treasury and $1 in tax-avoidance behavior. The taxpayer is harmed more than the amount received by the public treasury, because the taxpayer took costly actions to make sure that the tax liability was not even higher. Economists agree that taxes have an excess burden beyond the revenue surrendered to the treasury by taxpayers, even if they do not agree about the exact amounts. Examples of excess burdens include health insurance plans that are excessively expensive in part because of their special personal income tax treatment, and corporate debt burdens that are excessive in part because of the special treatment of interest payments by the corporate tax. All together, the excess burden of taxes in the United States is more than a trillion dollars a year. Of course, government spending may have great benefits, and that spending would be worthwhile if it exceeded all of the costs to the taxpayer (namely, the taxes they pay and the excess burden they bear). With the telephone tax, the amount by which calling is reduced by a tax, and thereby the excess burden of that tax, depends on the rate of taxation on those last 200 calls: a penny a call in my example. This business propensity to avoid the tax by seeking other communication means would be the same if the tax law provided a tax exemption for the first, say, 400 calls a day, because reducing calls from 1,000 to 800 would still result in a tax saving of $2 per day. The only difference is that public treasury would get less revenue with the tax exemption in place: $4 per day rather than $8. And the tax exemption means that each $8 brought the treasury costs the taxpayer $10 rather than $9 (with the exemption it takes two days to get $8 in revenue, rather than one day). So tax exemptions and other loopholes reduce revenue collected without necessarily affecting the marginal tax rate. In this way, tax exemptions and loopholes raise the excess burden per dollar of revenue and thereby the ultimate cost to taxpayers of bringing any given amount of revenue into the Treasury. Economists’ opinions on tax exemptions and loopholes generally derive from the arithmetic of excess burdens. Exemptions and loopholes raise the marginal tax rates – the creators of excess burden – required to maintain treasury revenue. So if you want the government to get its revenue with a minimum of economic harm, smaller exemptions, loopholes and marginal tax rates are the way to go. The federal estate tax — sometimes called the “death tax” by its critics — is remarkably extreme in terms of the size of its exemptions and marginal tax rates. The estate tax brings in only about $20 billion a year (with no revenue this year) despite marginal tax rates that have varied from 45 to 55 percent, because of its large exemptions and many loopholes. And some of its excess burdens are evident: an entire estate-planning industry would be largely unnecessary if marginal estate-tax rates weren’t so high. Planning is part of the reason that many estates do not pay tax, and planning is part of the excess burden. Alternatives to President Obama’s plan include elimination of the estate tax, sharply reducing its rates or integrating it with the capital-gains part of the personal income tax. If necessary, the small revenue loss could be recovered with a tiny increase in the rates of a broader-based tax, like the taxes on payroll or personal income. Professor Thaler explained how that eliminating the estate tax would “make sure heiresses like Paris Hilton have the proper attire for trips to St.-Tropez.” I agree that the estate tax’s best attributes do not derive from economic efficiency, but rather its contribution to the sport of envying some of the love-to-hate members of America’s rich. About 14 minutes ... for a shorter version, jump ahead to the 6:40 mark. The Obama administration’s Home Affordable Modification Program for reducing mortgages of homeowners who owe more than their houses are worth has fallen far short of its objectives. Officials seem surprised by that outcome and blame the result on administrative problems. But, all along, the program’s bad economics doomed it to failure. Home buyers take usually out mortgages that cover only part of the value of the houses they are buying. In other words, the house is worth more than the mortgage owed. This means that in the event a borrower defaults, the lender can, in most cases, be repaid in full by foreclosing on the house and selling it to someone else. However, housing prices have fallen dramatically since 2006. By 2009, about one in four home mortgages was “under water” — the market value of the house had fallen below the amount owed on the mortgage, or, put differently, the home equity was negative. Under President George W. Bush, the Federal Deposit Insurance Corporation, the Federal National Mortgage Association (known as Fannie Mae) and the Federal Home Loan Mortgage Corporation (known as Freddie Mac) all announced debt forgiveness or “loan modification” formulas. The Treasury Department under President Obama continued this policy with the Home Affordable Modification Program, part of its Home Affordable initiative, which replaced the Fannie and Freddie programs. The modification program alone was aimed at three million to four million mortgages. These modification programs encourage lenders to reduce mortgage payments, so that each borrower’s housing payments (including principal, interest, taxes and insurance) are no more than 31 percent of the borrower’s gross income. The payments are to be reduced for five years or to whenever the mortgage is paid off (whichever comes first). The amount of the payment reduction depends on the borrower’s income — the less he or she earns, the more the payment is reduced. For example, a borrower whose annual family income is $100,000 can get housing payments reduced to $31,000 a year; a borrower whose annual income is $50,000 can have the payments cut to $15,500 a year. If the mortgage modification rules were actually followed, one implication would be that a family that earns $50,000 more in the year before the modification stands to pay an additional $15,500 a year for five years on housing payments — a total of $77,500. Adding $50,000 to your income adds $77,500 to your expenses: the mortgage lender gets more than 100 percent of your extra income! Economists call this a marginal “tax rate” that exceeds 100 percent, because the person earning that income is obligated to give all of it to a third party (the lender, in this case), and then some. Economists may argue about how high tax rates should be, but we all agree that marginal income tax rates of 100 percent (or more) are terribly destructive. And the terrible incentives in the federal mortgage modification guidelines were known even before the Obama administration put together its program. Because of its destructive economics, the modification program was proposing changes that were only marginally beneficial to borrowers and massively costly for banks. Assuming that banks understood this, I predicted that banks would pursue their own interest by randomly and arbitrarily refusing to modify most of their mortgages according to the program formula. A year and half into the program, this is no longer just a theoretical possibility. The Associated Press reported that many borrowers say the modification program is a bureaucratic nightmare. The A.P. report said, “They say banks often lose their documents and then claim borrowers did not send back the necessary paperwork.” Instead of modifying three million mortgages and preventing their foreclosures, less than one-half million mortgages have been modified under the program, while about three million borrowers received foreclosure notices (see the latest report by the Office of the Special Inspector General of the Troubled Asset Relief Program). Rather than overtly contradicting the Treasury by denying eligible borrowers, banks are encouraging borrowers to deny themselves by requiring those borrowers to endure deluge of paperwork. Both the Bush and Obama administrations have run roughshod over incentives, and the housing market and the wider economy continue to suffer because of it. We can hope that economic policy might be different after yesterday’s electoral shake-up, but more likely we’ll be drinking old wine from new bottles. This is why we have a field called macroeconomics. I agree! That's why modern macroeconomics pays attention to supply, and not just demand, even while the average businessman may think that "more customers" are all he needs to be successful. And that's why it's wrong to expect policies that reduce production to increase spending.